EP 3 weeks, 5 days ago. 1809 has been sort of a mess for myself, with wifi issues, some sort of kernel panics being recorded and just feeling like the 1809 is unstable at times. At one point I had to install Ubuntu on a PC just to take a break from Win 10. Not that I see a real sensible move to Linux minds you. It has got its own set of issues at times. I mostly wanted to see if my wifi issues were hardware related or OS related. I concluded Windows 10 1809 was the issue with much of my issues. Now were on the cusp of yet another Windows 10 release 1903 and all I can do is pray. Closer to releasing? Didn’t that happen four or five months ago for 1809? 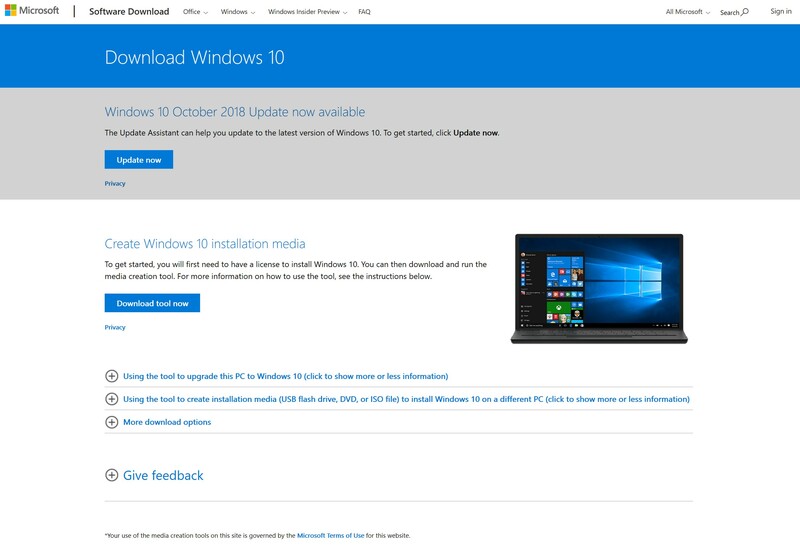 Windows 10 will automatically download the October 2018 Update on your eligible device if you’ve turned on automatic updates in Windows Update settings. That does look like Microsoft has decided its time for everyone to move to 1809. They are providing extensive links on the same page that may solve any updating problems you may encounter… giving directions to seek, use the Update Assistant, troubleshoot updating problems, fix updating issues, free up hard drive space, and fixing internet issues. Then, for those who are still on Windows 7 and 8.1, they link to how to a Update to W10 FAQ. Just in case anyone had any doubts, Microsoft wants you to update to 1809… and are offering quick access to anything they think may facilitate the process. Just a non-techy note of frustration. It is hard enough to learn terminology and how to apply it. Microsoft seems to go out of their way to make things more confusing (like applying seeker status before documenting it). However, I don’t think this particular example is intentional on their part (given all the ways to fix updating that they have provided links to). If version 1809 isn’t offered automatically through Check for updates, you can get it manually through the Update Assistant. So… I click on the link for Update Assistant, and am taken to “Download Windows 10” where I am offered the ‘media creation tool’. Nowhere on the page are the words Update Assistant. Maybe the media creation tool is the Update Assistant, but it would be nice to use the same words to describe it, rather than leave one to feel it may be a bad link. The support page on Update Assistant also links to the media creation tool, so it leads me to believe that is what they are referring to as Update Assistant… but clarity in regards to labels just isn’t there, and won’t help their cause. It surely increases frustration, especially for a non-techy facing updating problems to begin with. At the top of the download page it says, “The Update Assistant can help you update to the latest version of Windows 10. To get started, click Update now.” which gets you the update assistant. Which does not mention Windows Update Assistant anywhere. If your point is that if I click to down load the media creation tool, I’ll find the reference that you quote, you are simply making my point for me. Why would I click to download a media creation tool when I’m looking for Windows Update Assistant to begin with? So you don’t see the top part which is only applicable to Windows 10. On the support article page which Woody thought had changed, only the bottom line and link is applicable to Windows 7/8.1. Looks like there is only the Intel Display Driver Problem left. I agree with the confusion it is really hard to get to the website to retrieve the upgrade assistant. Mostly you’re landing on the site that holds some not so clear links and they get you to the page of media creation tool and not Windows upgrade assistant. The reason is internal code that the iso always install on normal priority while other methods are designed to run with internally low prio so users don’t get disturbed during an upgrade and can continue to use the device. We experienced similar issues that Anonymous did with 1809: Wi-fi issues, miracast / screenbeam issues, and issues with Direct Access. We also have an issue with the 1809 UIP always downloading Dynamic Updates from the Internet (Microsoft) instead of WSUS. At one point 1809 got so bad for me that I reimaged my laptop back to 1803 just to become productive again (I was on 1809 too long and had lost the ability to revert). Holding on to 1803 and waiting and hoping that the next new release will be more reliable is not a reassuring strategy to run an enterprise on. Where do you see that? and d/l them?? And how did the smiley get sooooo big ?? oh well. maybe wait until Fri. 3/22 or next Tue. 3/26 to see if they’re available in the VLSC. otherwise follow my advice I mentioned previously and just ask somebody in the MDL forum on how to get them.